Annan finally secured a victory after a miserable run of results has seen their League Challenge falter since the beginning of the year. It was by no means a classic match between 2 teams for different reasons trying to achieve victory and for the Shire it was a disappointing result following their convincing victory over Queens Park at the National Stadium last week and the defeat keeps them at the foot of the table. The Annan line up showed a couple of changes from the team that were defeated in the midweek match at Berwick with Ben Jago back from suspension and Matty Flynn back from injury taking the places of Bryan Gilfillan and Lewis Guy who were both relegated to the substitutes bench. The Annan boss elected to go for a back four in an effort to stem the flow of goals which have plagued Annan in recent weeks and for the first time since the 2nd November Annan managed to keep a clean sheet in a league match which set them up for this victory. The match started brightly for both teams with Annan forcing the first corner in the 7th minute when a promising move ended with Osadolor setting up Flynn who’s well directed shot forced the corner and at the other end Neil McCabe’s 25 yard effort went narrowly past the upright. Ryan McStay came close in the 14th minute when his swerving rising shot from 20 yards went over the bar. Minutes later Osadolor’s low shot from 20 yards was confidently saved by Barnard. The match continued to flow from end to end, the Shire forced their first corner in the 17th minute when Nicoll conceded and Annan had Ryan McStay to thank when he cleared McKenna’s effort off the goal line for another corner. Ross Fisher was booked for a challenge on Flynn and Peter Watson was booked minutes later for a deliberate hand ball in the 29th minute. Annan’s most promising move of the half in the 34th minute saw Jago and Todd combining to pick out Osadolor who’s well struck cross was confidently saved by Barnard. 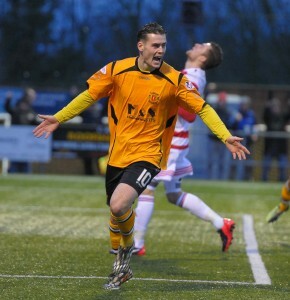 At the other end Andy Russell picked out David McKenna who’s well directed header went narrowly over the bar. As the match approached half time the home team were forcing Annan to defend and they came close to breaking the deadlock when Thomas Orr’s shot hit the side netting in the 38th minute and as the clock wound down towards the break it was Orr who once again came close when his well struck shot from the edge of the box went high and wide. East Stirling started positively at the start of the second half and the Annan defence did well to block to attempts at goal before Annan scored the goal which eventually settled the game in the 51st minute. Ben Jago worked his way into a good position finishing with a low shot from 20 yards but the shot was flicked on by Josh Todd who guided the ball into the net from 6 yards. The goal gave Annan breathing space and the confidence to push forward and Flynn’s well struck shot in the 63rd minute was saved by Barnard. Minutes later Barnard tipped over the bar a high looping McNiff cross to the back post and from the resulting corner kick Nicoll’s effort went narrowly wide of the target as Annan went in search of another goal. At the other end Nicoll conceded a corner kick as the home team pushed forward and Kris Fauld’s shot from 16 yards went narrowly over the bar. This was followed by an Andy Russell effort in the 81st minute when his 15 yard shot went narrowly past the post. The Annan goal survived a charmed period when Kriss Fauld’s header was tipped over the bar by Blair Currie and from the resulting corner the Annan defence worked hard to thwart the determined efforts of the home team. It was an important victory for an Annan team who have struggled since the new year and for them to have any chance of making the play offs they must repeat the form displayed in the opening third of league fixtures. The league was won on 71 points last season and it is highly probable that 62 points will win the league this season and for Annan to get anywhere near that total they must pick up 24 points from their last remaining 12 games which is the same form that they produced in their first 12 games of the season when they picked up 23 points. There are however 7 teams with a realistic chance of achieving this total so it is all to play for as we enter the last third of the season. EAST STIRLINGSHIRE :Richie Bernard, Connor Greene, Chris Townsley, Lloyd Kinnaird, Ross Fisher, Kris Faulds, Andy Russell, Neil McCabe, Thomas Orr, David McKenna, Scott Ferries (Gavin McMillan 73 min). SUBS NOT USED: Aaron Lynas, Jordan Cairnie, Andy Kay, Reece Donaldson, Michael McMullen, Darren Dollan GK. ANNAN ATHLETIC: Blair Currie, Ben Jago, Kevin Nicoll, Martin McNiff , Peter Watson, Ryan McStay (Lewis Guy 85 min), Steven Sloan , Matty Flynn, Smart Osadolor (Stuart McColm 80 min), Josh Todd ,Rabine Omar, SUBS NOT USED: Jordan Hart, Greig Macdonald, Bryan Gillfillan, Liam Park, Scott Norman.